Water Reporter offers all subscription holders the opportunity to build interactive maps that showcase observations and quantitative data in their websites and share updates to the maps through social media platforms. Keeping with the tradition of all Water Reporter features, Maps offer subscribers the opportunity to customize the visualization by changing base maps or adding watershed layers. From your dashboard, click on the green plus circle. The good news is that none of these fields is required to build your map - each gives you opportunities to customize the map. Description. Describe your map so other account administrators understand what you are displaying here. Data Sources. Add monitoring locations from your Flow feature to this map by selecting one or more of your organization’s data sources. Data sources will only display if you have identified collection stations and are subscribed at the Pro level. Watershed boundaries. You can add watershed boundaries to your map. For consistency, make sure that all selections share the same HUC classification (8,10,12). If you have a USGS hydrologic unit code handy, type or paste it into the box for more exact searches. Fill Color. Whip up your own hexadecimal color that will show the shape and boundary of your watershed(s). All watersheds will have the same color! Fill opacity. The opacity value must be greater than or equal to 0 and less than or equal to 1. Watershed layers with a fill opacity of 0 are completely transparent, while those with a fill opacity of 1 are completely opaque. Map Style. 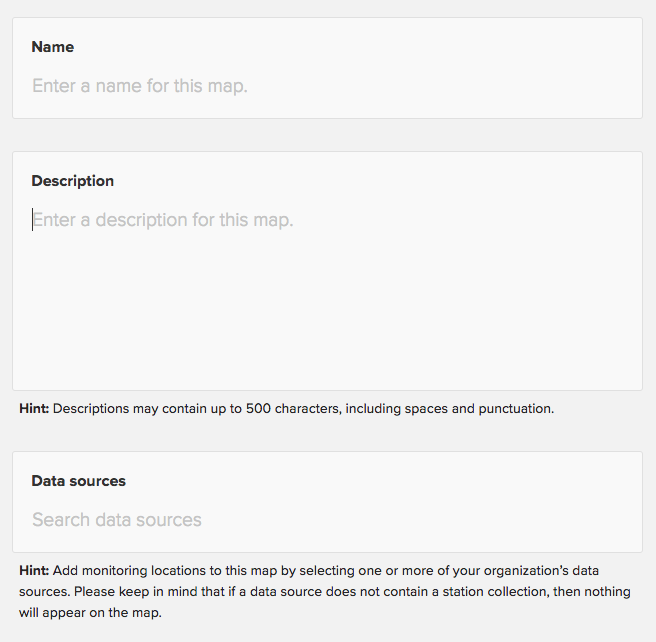 To set the map’s baselayer appearance, select any of these options or use your own Mapbox style. 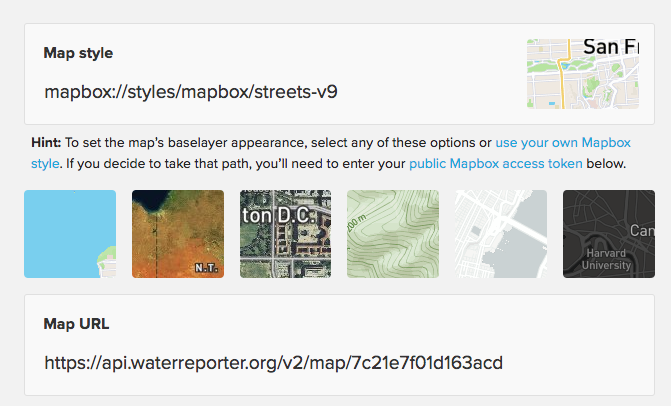 If you decide to use your own style, enter your mapbox access token below. Control which posts appear on the map by adding a search word (e.g. “salmon”) and/or hastag (e.g. SAV). To create a campaign-specific map, simple enter the name of the campaign in the box below. Campaign. Enter one Campaign name. We provide you with an iframe code so you can easily take your custom map of your observations and display in on your website. You can share your map with everyone on Water Reporter and throughout your social media accounts. You can add comments and then pushed a stylized announcement anytime you want to discuss your map. If you add a filter, the system will create a new map link and iframe code for you to use. You'll have to update your code in order to see the filtered results!